While Russia is increasing its efforts to push Belarus in its geostrategic orbit even further, Europe appears to have taken the "wait and see approach". As a result, those who wish to see changes in Belarus are losing the momentum. Russia is pressing Belarus to obtain its most lucrative assets. The most profitable Belarusian state enterprise Belaruskali may end up in the hands of the Russian tycoon Kerimov. Russia intends to keep higher prices for energy supplies, undermining the main cornerstone of the Belarus "economic miracle" which was based on cheap Russian oil and gas. They also warned that if Belarus further restricts Russia's media outlets it would have difficulties with securing Russian loans in the future. Kremlin is in the process of getting nearly everything it wants. Europe is loosing on nearly all fronts because of its passivity. Symbolic sanctions or traditional condemnations have little effect on official Minsk. Some in the European Union think that the relations with Belarus have reached their lowest point and can only grow from there. This may not be the case because the human rights situation may further deteriorate as Lukashenka is trying to resist growing public unrest. The EU's involvement rarely goes beyond declarations, and modest support for NGOs which is far lower than in any other region of Europe. Although Moscow is likely to wait until the Belarusian leader is on his knees and then bail him out, keeping Lukashenka on its balance sheet may become expensive for Russia. Oil prices are high these days because of the unrest in the Arab world, but Kremlin needs money before the next election cycle. Moreover, Russia has to feed not only its impoverished South with separatism and Muslim extremists, but also other regions such as South Ossetia and Abkhazia. This is why Belarus will have to keep looking for money elsewhere. It was Russia's Finance Minister Kudrin who recommended Belarus to apply for an IMF loan a few months ago. Belarus has done so, but the changes of getting more money from the IMF look uncertain. Given the role of Russia in Belarus, it is important to keep talking to the Russians and help them understand that if Belarus has another president, it will not be the end of the world for Belarus-Russia relations. The fear that Russian-speakers will be prosecuted if Lukashenka goes have little substantiation. Unlike in Ukraine or the Baltic States the vast majority of Belarusians in cities speak Russian as their first language and it will not change any time soon. If Belarus becomes a market economy, joins the World Trade Organization, and freely trades with both Russia and the European Union this will only help Russia's own economy. However, talking to Russia should not be main policy tool of the West because there are nearly 10 million people in Belarus who need to be reached. With reduction in economic subsidies from Russia, many Belarusians for the first time have seen that that their king is naked. Public dissatisfaction grows and there appears to be no quick fix for the Belarusian economy. The West needs to make sure that Belarusians understand why this is happening and have access to uncensored information. It is not enough to allocate funds for Belsat or radio stations based in Poland. It is important to monitor whether what they produce actually reaches an average Belarusian. If media only reaches opposition activists, the effect will remain limited. With some of the most proiminent Belarusian opposition leaders in prisons, frequent blockades of Internet web sites and traditionalmedia on the brink of survival, cross-border broadcasting, as in the Soviet times remain the only way to spread uncensored information. Given that Belarus is a relatively small country, signals from neighbouring Poland and Lithuania can reach many people and help them understand what is going on. Second, the West needs to continue supporting nation building in Belarus. One of the reasons why Ukraine is more independent now is because at some point of its history the Austria-Hungarian Empire actively supported nation building in Western Ukraine. Many historians agree that this helped mature the nation. In Belarus the situation was different. Over the last three centuries Belarusians were regarded as Poles by the Polish and as Russians by the Russians. Now it is in Europe's interests to help Belarus people to mature from Soviets to Belarusians. Helping them mature as a European nation would serve the long-term goal of the country's independence. On practical level, the West should set up programs to facilitate translation of movies and books into Belarusian and encourage teaching in Belarusian language – both in Belarus and at the institutions such as the European Humanities University. If the Belarusian government is not doing that, there are good reasons for the West to takew this role. Finally, Europe should simplify and make less expensive visa procedures for Belarusians. It is unacceptable that Belarusians have to pay 60 euro for a Schengen visa, while Russians and Ukrainians pay merely 35 Euros. Rapid impoverishment of the Belarusian population creates an insurmountable travel barrier for many Belarusians. Moreover, it is easier to get a multiple entry Schengen visa for a citizen of Russia with a population of over 140 million people fighting against Islamic terrorists than a relatively small and safe Belarus. Facilitation of free movement of persons would help Belarusians appreciate advantages of democracy and market economy. Coupled with ensuring better access to uncensored media, this could achieve more than yet another round of declarations from Brussels. Yarik Kryvoi is the editor-in-chief of Belarus Digest and the founder of the Ostrogorski Centre. Several months into the grave economic and social crisis the Belarusian opposition seems to be concerned only about two problems: how to achieve the release of political prisoners and how to keep their offices. The economic crisis, the impoverishment of the people and the cheap sale of the state property are largerly ignored. The opposition leaders do not use these issues to mobilize the population. Viktar Ivashkievich, veteran of the Belarusian opposition, proposed the first event on the crisis for as late as 16 October. Other politicians prefer to limit their activities on social problems to media comments. The post-election repressions proved effective: the oppositional politicians have become extremely cautious. Many years of continuous failures have negatively effected intellectual capacities and institutional structures of the Belarusian opposition. Many capable individuals have left to avoid being permanent losers for years. To be a freedom fighter may be romantic for a brief period, yet after a while it makes more pragmatic people think twice about their future prospects. As a result, they go elsewhere. Now, the proportion of emotional idealists in the Belarusian democratic opposition is disproportionally high. There are far too few pragmatics, however. No wonder that analytically and strategically the opposition looks not much better than the government. Even to launch a campaign on social problems or against selling state flagship companies seems to be an insurmountable task for the opposition at the moment. And probably not because they fear the consequences, but because there are not enough methodological and analytical capacities to produce such new concepts. The parties' regional structures have disintegrated as far as never before. This uncritical approach to the results of their own activities since 1996 on the part of the opposition is combined with an ideological right-wing tilt. 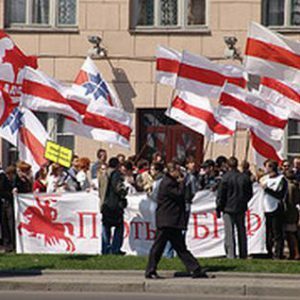 There are no left-wing parties in Belarus to be on par with the right-wing political organizations. Even worse, the right-wing parties are taking purist rightist stances and – contrary to their Western European counterparts – they have failed to articulate a social agenda. Thus, for instance the Christian Democrats effectively take as their model the US Republicans and not Western European Christian Democratic parties, which have long ago understood that social matters should have a place in the programs of non-left parties as well. Commenting on the latest Internet-organized protests in Minsk on June 15th, one of the leaders of the Christian Democrats, Dzianis Sadouski, declared, „We should not go to a social action with party flags“. Instead, the Christian Democrats are going to hold 100 pickets and other actions supporting political prisoners in all regions of the country and start collecting the signatures under a petition calling for their release. A former presidential candidate, Vital Rymasheuski emphasized, “no loans, no anti-crisis program will work in Belarus, unless main political demands are provided for. That is — free elections, media freedom and freedom of public organization and political parties activities». Such ideological right-wing purism deliberately blind to social issues is pursued in the country where social and welfare traditions of Soviet times have formed many common people's beliefs. That omen loomed over the democratic opposition in Belarus since its beginning in the late 1980s. The then opponents of the Communist rule have positioned themselves as the representatives of nobility and disregarded that Belarusians are a nation with strong egalitarian traditions. The democratic opposition suffered subsequently numerous setbacks yet did not give up socialism-bashing as their major idea. The same fear of touching any presumably socialistically-sounding themes may explain why nobody is attacking the government for selling the Belaruskali, the most valuable asset of the Belarusian state. Even the media are limiting their coverage to neutral when describing the situation. Without doubt, selling such a national company – comparable in its importance to national oil companies in oil-producing countries – under more than unclear conditions should be a cause of nationwide protest campaign. After all, almost no news on presumable Belaruskali deal with a Russian oligarch reach the public, and given the track record of Belarusian regime, no one expects it to act openly. The opposition, however, does not touch the issue. Yet even the pure rightists should see that any government to come after Lukashenka will find empty pockets, the Belaruskali sold and money for it already spent. It will simply have no more internal resources for reforms – on any ideological platform. Besides, there are doubts about the rationale of privatization of mining company as such. Maybe the problem is that the opposition is divided and therefore unable to take a stronger line against the government? Today, many speak about uniting the oppositional movement. Yet, this would make sense only when the forces to be united are something more than zero each. Adding zeros together hardly brings an increase in strength, as the 2006 presidential election has clearly shown. Though the last elections in December have demonstrated the untapped potential of protests that exists in Belarus, it is clear that the people were gripped by the appeal of candidates and not the political parties, whose popularity is negligible. The balance of more than a dozen years of democracy proponents struggle with the regime is not impressive – Lukashenka has won, opposition is defeated and its structures eliminated, media and NGOs have had the same fate. Recent protests at the Belarusian-Polish border have shown that the angry Belarusians are not talking the language of opposition and possibly would not articulate their condition in political terms at all. They even sang the state hymn – a Soviet-style song reinvented by Lukashenka's regime and out-rightly rejected by opponents of existing Belarusian regime. One thing is clear. This opposition will stay aside of future political developments determining Belarus after Lukashenka. The government is currently overcoming its weakness – though by a terrible price of selling the best national companies – and is going to retain its control of the nation by gradual and not acute impoverishing the people while suppressing any protests in the bud. Democratic opposition effectively are assisting it. Finally, either Lukashenka will prevail or some figures of his regime will emerge as new rulers in Minsk – but not the old-style Democrats. The question of who is guilty for defeat of democratic movement in Belarus cannot be explained only by recent repressions. Of course, repressions played its part, yet the opposition is weakening itself by behaving this way and dropping the most actual issues. As a result, it loses popular support, remains weak and unimportant partner for the government and – last but not least – is extremely susceptible to foreign pressure. 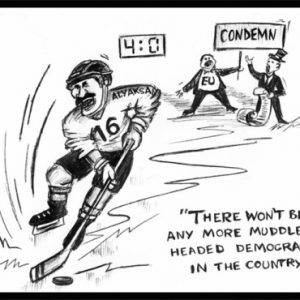 Apparently, the foreign support from abroad – moral and material – both helped the Belarusian democratic opposition to survive and made it inefficient. The most evident example is the OSCE intrusion in 2000-2001 when the opposition was too week to resist the foreign friends' proposal to put Uladzimir Hancaryk as its single candidate. The very first measure to change the situation should be a critical review of the opposition's activities. To be able to conduct a long-needed 'cost-benefit analysis’, the Belarusian democratic movement needs more robust media and think tanks which will let it see itself from outside. It is also important that the opposition learns to listen to even the most outspoken critics and learns from their criticism.